Laura Boswell is a landscape printmaker working exclusively with linocut and traditional Japanese woodblock. 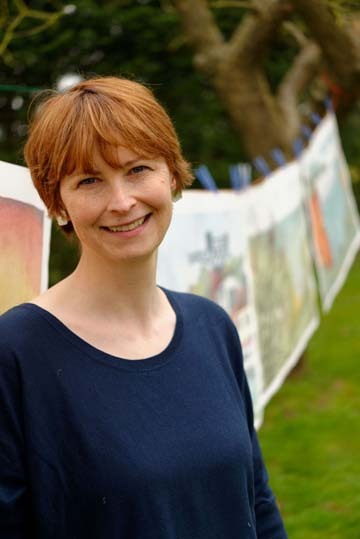 She has a degree in Art History/Visual Art from the University of Wales, Aberystwyth and has recently been elected to the Royal Society of Painter Printmakers. She undertook two residencies to train in Japan, studying woodblock printmaking with master craftsmen, and her work often looks to Japan in its use of white space and minimal approach. Laura shares the Japanese appreciation of rigorous training; her work often displays impulsive line and brushwork, requiring meticulous cutting and printing to give the impression of fluid spontaneity. Laura will be attending a further Japanese residency in 2019. In addition to her printmaking, Laura teaches, writes a column for Artists and Illustrators Magazine and works on the occasional public art project. Her prints feature in national collections including the House of Lords and the Library of Wales.